Hot Deal! We've marked this unit down $4900 from its regular price of $13888. This VW Jetta offers the best handling in its class, and the GLI model is easily the best performer of them all. This 2013 Volkswagen Jetta is for sale today in Mission. 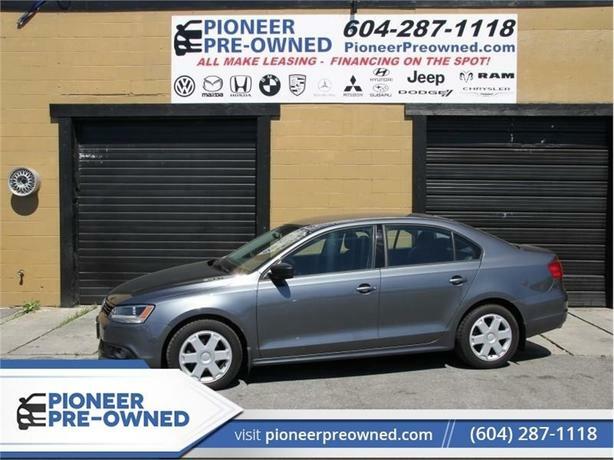 This Volkswagen Jetta is the sixth generation in a long line of durable and fun to drive VW's. It gives you high build quality and a driving dynamic that is always associated with a European car. The 2013 Jetta may be classified as a compact car, but these awesome cars feature a roomy, 5-passenger interior. In real-world situations, four adults will be more than comfortable while rear-seat legroom and head room is very commendable. This sedan has 97318 kms. It's grey in colour and is completely accident free based on the CARFAX Report. It has a 6 speed auto transmission and is powered by a 115HP 2.0L 4 Cylinder Engine. Pioneer Pre-Owned has more than 60 years of experience in the automotive domain in B.C. backing it up, and we are proud to be your first-choice used car dealer in Mission! Buying a vehicle can be a stressful time. WE CAN HELP make it worry free and easy. How is this worry free? Our team of highly trained Auto Technicians do a full safety inspection on each vehicle. Our vehicles come with a Complete Car-proof Report and lien search history. We can deliver straight to your door or we can provide a free hotel if you so choose to come to us. We service BC, Alberta and Saskatchewan. Do you have credit issues? We know that bad things happen to good people. We all have a past, if yours is preventing you from moving forward WE CAN HELP rebuild you credit. Are you a first-time buyer, a new Canadian resident on a work permit? Is a current bankruptcy or recently discharged, past repossessions or just started a new job holding you back? TOUGH CREDIT, NO CREDIT, or GOOD CREDIT. Are your current payments to high? Do you like the vehicle you have now, but would love to lower your payments? Refinancing is Available. Need Extra cash?